This specialized tactical unit is under the command of a Lieutenant. This 18-officer team consists of 2 separate elements each led by team leaders (Sergeants) and filled with tactical personnel. The team is multi-disciplined and provides the officers and the community a valuable service. 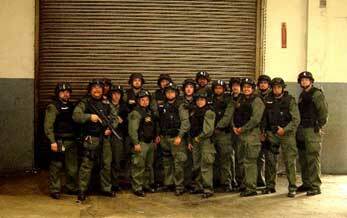 Members of “S.O.R.T.”, as commonly referred to, provides an immediate response with a trained mobile field force to quell major disturbances when called upon within the city and neighboring police agencies and also serves as the departmental tactical unit to perform hazardous warrant services and resolve select barricaded suspect situations. Members of the S.O.R.T. team have undergone specialized tactical training and utilize a variety of specialized weapons, tools and tactics. Each member is required to pass a quarterly physical fitness test and come from a variety of bureaus with in the police department. Members must test for a position on the team. Each member voluntarily accepts this collateral duty.